I figured it was about time I started thinking about this 32 Before 32 goal (read ten books from 1982), because time is marching on, and before this one, I had only read one. I now have quite a few from the library, so I can crack on! When I reserved The Prodigal Daughter at the library, I didn’t realise that it was actually the second book in a trilogy. In fact, I didn’t really know anything about it, I reserved it purely and simply because it was published in 1982. It wasn’t until I actually looked at the cover of the book that I realised that it had the United States presidential seal on it, and I realised then that it was probably more up my street than I had previously suspected. It tells the story of Florentyna Rosnovski, the daughter of a Polish immigrant who has spent years building up a hotel empire, along with a grudge with a local banker. The story of the grudge, unbeknownst to me, is told in the first book in the trilogy, Kane and Abel. Florentyna is a precocious child with a talent for academia, and decides from an early age that she wants to be the president, following in the footsteps of her idol, Franklin Delano Roosevelt. Somewhat predictably, she falls in love with the son of her father’s mortal enemy, and as a result, she is estranged from her father for many years. i really enjoy a book that spans several decades, so reading about Florentyna’s life, from when she is born in Chicago in the 1920s, until she is challenging for the presidency in her sixties, was really appealing to me. Added to this is that half of the story is set against the backdrop of the American political system, something that is of particular interest to me, and I was always going to enjoy reading it. The depth of knowledge of the political system is very good, and if Jeffrey Archer wasn’t a famous (or infamous) name in British politics, I would have no trouble believing that the author was an American. As the book draws on, the real-life events that have provided the backdrop to the story have to become imagined, so we get a British Prime Minister in Neil Kinnock, and, somewhat bizarrely, Prince Charles marrying Diana in the early nineties. 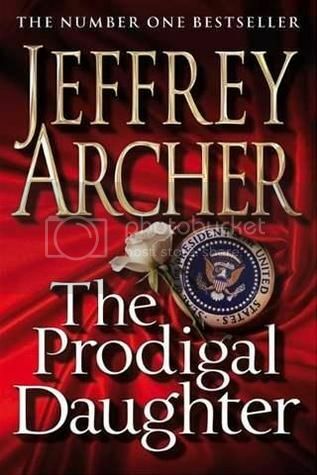 None of this, nor the reputation of Jeffrey Archer himself, detracted from my enjoyment of the novel. It’s pretty well written, and the story is entertaining. Sometimes it feels a bit as though Florentyna can do no wrong, and then all of a sudden she has a reality check of some sort. These small hiccups in her political career and personal life can feel a bit shoehorned in, as though Archer has suddenly realised that readers might not warm to a lead character who leads a completely charmed life. But overall, I enjoyed reading about her life and following her as she attempts to achieve her ultimate ambition. Although since reading the book I have realised that this is the middle story of a trilogy, I don’t see myself reading the other two books. While I enjoyed this one, I don’t think I need to read about the feud between the two men of the first book, nor do I necessarily want to read about Florentyna’s life after this book. Two down, eight to go on number one of 32 Before 32 – read ten books from 1982.